Nobody wants to spend extra on energy bills. But if you don’t use your water heater correctly, you can expect higher energy bills AND poorer performance from your water heater. One of the most common water heater mistakes that wastes money is setting your water heater temperature too high. You see, the higher you set your temperature, the more energy your water heater will consume to heat your hot water. Plus, if your water heater temperature is set too high, the pressure inside the tank can raise to dangerous levels. And high pressure can cause leaks, which are very expensive to fix (sometimes, it means you’ll have to replace the water heater altogether). So, what temperature is considered too high? According to the Department of Energy, any temperature over 120° F is usually too high for most households. The trouble is some water heaters are preset to 140° F when they’re first installed. But water heaters set to that temperature cost you an additional $30 to $60 annually, compared to a setting of 120° F.
Note: If your water supply is prone to Legionnaires’ Disease, then you may want to set your water heater to 140° F. That temperature will kill that strain of bacteria. Check with your local water provider to see if your area is at risk for Legionnaires’ disease bacteria. If you think your hot water is close to 140° F and the dial is closer to the hot side, try turning the dial towards the “warm” side. Then, you can run the hot water for several minutes and check the temperature in a glass with a thermometer. If the temperature is too cold or too hot, go back and readjust the red dial. • For electric water heaters, look for the heating element thermostats (you’ll either have one or two) on the side of the tank. You’ll see a white dial that corresponds to a certain temperature. 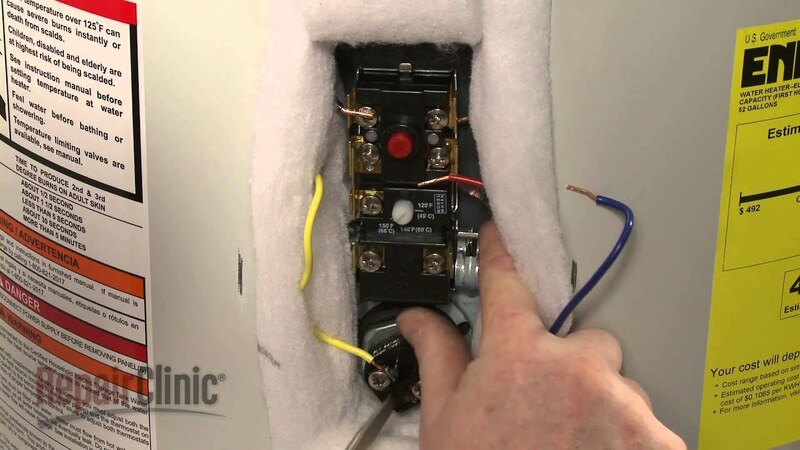 Make sure it’s set to 120° F.
If you ever hear loud popping/hissing/banging noises coming from your water heater, you should contact a professional ASAP. Those sounds usually mean that you have severe sediment buildup in your water heater tank. Sediment buildup is when minerals in the water supply settle and coat the bottom and sides of the tank. When you have sediment buildup, small pockets of water can get trapped between the sediment and water heater burners/heating elements. When the water heats up into steam, the steam bubbles erupt violently from under the sediment piles, creating a loud popping sound. In addition to the annoying sound, sediment buildup can also raise your monthly energy bills. You see, sediment buildup creates a thick barrier between the heating element/burner, which makes your water heater work harder to heat your water. The more your water heater has to work, the more energy it uses. So, if you hear loud popping noises, don’t ignore them—contact a professional to clean the sediment from your tank. This water heater mistake is a big one. When your water heater doesn’t get annual maintenance, it loses efficiency due to sediment buildup and corroded/worn out parts. And when your water heater loses efficiency, it has to work harder, which raises your energy bills. During an annual maintenance visit, a professional plumber will check all parts to make sure they’re working properly. Plus, they’ll check your tank for sediment buildup. If your water heater has sediment buildup, the plumber can “flush” the tank, which will clear all of the sediment from your water heater. Haven’t had your annual water heater maintenance? Get our water heater tune-up for just $49.